There’s lots going on in the U.K.: Somebody close to the prime minister gossiped about a rival politician’s wife and said that her facial expression at a party—she looked anxious—was surely indicative of mental frailty. Now questions are being asked in the House of Commons, and we’re all terribly excited. 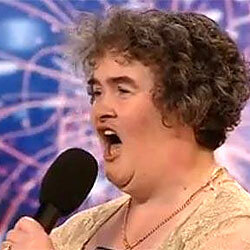 But the one thing absolutely galvanizing our anxious-to-the-point-of-mental-frailty nation is Susan Boyle. She is a plain, dowdy, unemployed, middle-aged woman from a remote part of Scotland who says she’s never been kissed. She appeared last week on a TV show called Britain’s Got Talent, hosted by mean Simon ­Cowell and Piers Morgan, who’s also a judge on the U.S. version. It works the same way: Various delusional ­weirdos show up, the audience howls, the judges are brutally succinct, and so on. And when Boyle waddled onto the stage, looking not at all like the prepackaged pop stars on Idol, the audience started sniggering before she’d even opened her mouth: the salt-and-pepper frizz, the red face, the most spectacular unibrow this side of Frida Kahlo. Just before her performance, Ms. Boyle swiveled her hips suggestively, and every bottom on every sofa in Britain clenched in horror and shame. “Who would you like to be like?” asked Cowell. “Elaine Page,” she said, naming the most successful British musical-theater star of the past twenty years. The camera panned to a pretty teenager, her face a rictus of derision. Boyle said she’d be singing “I Dreamed a Dream,” from Les Misérables. She raised the microphone. The laughter hadn’t fully died down yet. And then she opened her mouth and the most beautiful, pitch-perfect, goosebump-making voice came out: nuanced, laden with meaning: “I dreamed a dream in time gone by / When hope was high, and life worth living.” On a million British sofas, buttocks unclenched and eyes filled with tears. Everything terrible about these shows—everything ghastly and cheap and cruel, everything that harks back to Victorian freak shows—fell away. And the thing that’s supposed to happen but never really does—the blossoming of a person, and of their audience, through the transformative power of beauty and, yes, art, even if it’s a sappy show tune—did. It’s a really emetic thing to write, but that doesn’t make it untrue. When she’d finished, Boyle started walking off the stage, as though, once again, things hadn’t worked out quite how she’d hoped. The judges called her back. “Everyone in the audience laughed at you,” Morgan said. “They’re not laughing now.” The YouTube clip—so piteously human, so cynicism-­refuting—traveled the world and made people in other countries cry, too. Now she’s being interviewed on TV with a somewhat better hairdo. She’s our global recession’s first big star, deferred dreams and all.